An eclectic essayist is necessarily a dilettante, which is not in itself a bad thing. But Gladwell frequently holds forth about statistics and psychology, and his lack of technical grounding in these subjects can be jarring. He provides misleading definitions of “homology,” “saggital plane” and “power law” and quotes an expert speaking about an “igon value” (that’s eigenvalue, a basic concept in linear algebra). In the spirit of Gladwell, who likes to give portentous names to his aperçus, I will call this the Igon Value Problem: when a writer’s education on a topic consists in interviewing an expert, he is apt to offer generalizations that are banal, obtuse or flat wrong. In support of creative lexicography, I plan to be on the look-out for future opportunities to refer to the Igon Value Problem. PageRank or PR(A) can be calculated using a simple iterative algorithm, and corresponds to the principal eigenvector of the normalized link matrix of the web. The common thread in Gladwell’s writing is a kind of populism, which seeks to undermine the ideals of talent, intelligence and analytical prowess in favor of luck, opportunity, experience and intuition. For an apolitical writer like Gladwell, this has the advantage of appealing both to the Horatio Alger right and to the egalitarian left. 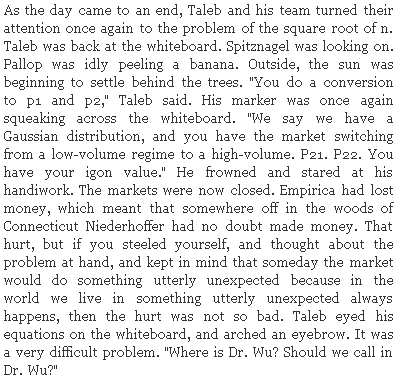 This "common thread" is central to the essay where Igon Value occurs: it constrasts Nassim Taleb, who thinks that investment success is "all pure luck", who "[doesn't] believe that things like the stock market behave in the way that physical phenomena like mortality statistics do", an "empiricist who doesn't believe in empiricism", with Victor Niederhoffer, whose "hero is the nineteenth-century scientist Francis Galton … and if he is your hero you believe that by aggregating and analyzing data points, you can learn whatever it is you need to know." No points for guessing who is the hero of Gladwell's narrative. And while eigenvalues don't play any direct role in the argument, things like Gaussian distributions and "fat tails" do. The "Igon value" flub doesn't increase my confidence that Gladwell has any clue at all what any of this really means. I was going to end like this: "What I find most interesting here is that neither the author, nor the stereotypically legendary fact-checkers at the New Yorker (where the pieces in What the Dog Saw originally appeared), nor Hachette (What the Dog Saw's publisher), took the trouble to hire an out-of-work mathematician to check the text for things of this sort. I presume this means that they assign a very low value to the reputational damage associated with such errors; though of course it might also be hard to find a technically-competent proofreader who would see how to correct the flubs without disturbing the problematic substance." So now I'm puzzled. Did some copy-editor at Hachette introduce the error? Was the mistake in Gladwell's draft, transferred uncorrected to Hachette despite having been fixed at the New Yorker? Did the New Yorker's editors read Pinker's review and retroactively fix Gladwell's 2002 essay in their archives? Inquiring minds want to know. 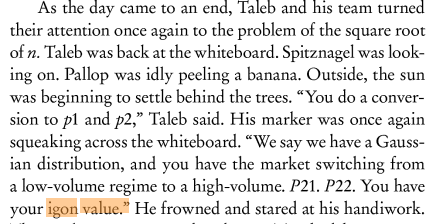 And credit the New Yorker with decent typesetting, to boot, with proper subscripts as well as an em dash and a comma. I suppose it's an instance of Muphry's Law that Pinker misspells "sagittal"; Gladwell might not know what it means, but Amazon's "Look Inside!" feature reveals that he does at least manage to get the right number of gs and ts. Pullum, 10 Jul 2006: "It appears that in software development divisions there is typically no one technically trained in syntax, semantics, and pragmatics overseeing the choice of language in the dialog boxes and help panels that are written." Can we count to 10 before we declare that because you-all have found an error somewhere, this means that editors everywhere are incompetent? Hm, I think I once knew a guy called Igon. Wasn't Igon a character in Ghostbusters? (which may have been the source of the nickname of the guy I knew) Maybe Gladwell wanted to make a pun and the New Yorker refused to let him. Maybe he thinks Taleb should really be considered to be talking about something subtly different from what everyone else calls eigenvalues. Maybe he's on a spelling-reform kick. @bianca – that would be Egon Spengler, pronounced "EE-gahn". Yeah, I think Mark is correct. I just checked the print version of the New Yorker from Apr. 22, 2002, and it is indeed "eigenvalue" there. We have nature and only nature. Within this nature we have differentiation in the way that living organisms perpetuate themselves. If we diagrammed this as a series of sets, nature would be the largest circle and within this circle we would have the circle of the animal kingdom (all living life from microbes to Homo sapiens sapiens), and within this smaller circle we would have mammals, and within the circle of mammals we would have humankind. All of these circles are included within the larger set: nature. Within this large set of living nature all living organisms manifest different ways of maintaining their existence (reproducing themselves) over time both individually and as a species. This is to say that the biological self is formed within the social that is a part of this larger set we identify as nature. This is what makes us unique and individual (social beings) as well as what makes us a complete set as individual members that form the same species. Q. How many people had to be oblivious to the existence of plants in order for this passage to see it's way into print? Sounds like part of the problem is the arrogance of ignorance ("Unskilled and Unaware of It") leading to a reverse Cupertino Effect. The refusal to accept that perhaps that little, squiggly, red line under the word might just be right. By the way, you misspelt "Eigen Value" in your hed. Whose law is it that says (and I paraphrase) that the probability of making an error in a body's own writing increases with extent to which a body is pointing out the errors of another? Murphy ought to be spelled M-u-r-p-h-y both places it's not. Could be a corollary of Murphy's Law. Some mistakes are deliberate. Pointing out a deliberate mistake makes you look stupider than making an accidental mistake — "better to stay silent and be though a fool etc". That said, I can't see how Gladwell's copyeditor could have thought "Igon vector" was some kind of joke. Reading your old post about the Attila corollary makes me wonder if you ever took note of the similar phenomenon for unpronounced H. The most prominent example is Ghandi/Gandhi. The writer seems to be thinking, "I know there's an extra H in there somewhere, but I'm not sure where it goes." Other examples are Ghengis Kahn and Bhudda. I'm actually a big Gladwell fan, and while it's true he's a better writer than mathematician, the argument that his "lack of understanding is crucial to enabling the zip" needs better support than that. Sure, it's a flub, but it seems a minor detail that's almost irrelevant. If this is supposed to be emblematic of poor scholarship, I'd be interested to see more damaging examples. And interestingly enough, the link to the Atilla Corrolary to Murphry's Law describes the "conversation of gemination"
The problem with Gladwell’s generalizations about prediction is that he never zeroes in on the essence of a statistical problem and instead overinterprets some of its trappings. For example, in many cases of uncertainty, a decision maker has to act on an observation that may be either a signal from a target or noise from a distractor (a blip on a screen may be a missile or static; a blob on an X-ray may be a tumor or a harmless thickening). Improving the ability of your detection technology to discriminate signals from noise is always a good thing, because it lowers the chance you’ll mistake a target for a distractor or vice versa. But given the technology you have, there is an optimal threshold for a decision, which depends on the relative costs of missing a target and issuing a false alarm. By failing to identify this trade-off, Gladwell bamboozles his readers with pseudoparadoxes about the limitations of pictures and the downside of precise information. But this “solution” misses the whole point of assessment, which is not clairvoyance but cost-effectiveness. To hire teachers indiscriminately and judge them on the job is an example of “going back and looking for better predictors”: the first year of a career is being used to predict the remainder. It’s simply the predictor that’s most expensive (in dollars and poorly taught students) along the accuracy- cost trade-off. Nor does the absurdity of this solution for professional athletics (should every college quarterback play in the N.F.L.?) give Gladwell doubts about his misleading analogy between hiring teachers (where the goal is to weed out the bottom 15 percent) and drafting quarterbacks (where the goal is to discover the sliver of a percentage point at the top). The common thread in Gladwell’s writing is a kind of populism, which seeks to undermine the ideals of talent, intelligence and analytical prowess in favor of luck, opportunity, experience and intuition. For an apolitical writer like Gladwell, this has the advantage of appealing both to the Horatio Alger right and to the egalitarian left. Unfortunately he wildly overstates his empirical case. It is simply not true that a quarter back’s rank in the draft is uncorrelated with his success in the pros, that cognitive skills don’t predict a teacher’s effectiveness, that intelligence scores are poorly related to job performance or (the major claim in “Outliers”) that above a minimum I.Q. of 120, higher intelligence does not bring greater intellectual achievements. The reasoning in “Outliers,” which consists of cherry-picked anecdotes, post-hoc sophistry and false dichotomies, had me gnawing on my Kindle. Infelicities gross and subtle – even as our igonoclastic author rails against blindspots and incompetence in his own specialisation. This Protein "Carybde" is later transmuted to "Charybdis" (p. 221), but as a rock. Alas, by then the sensitive reader has been terminally traumatised, and no doubt "book editors" are relieved not to have borne responsibility to cleanse such an Aegean stable. Igor, Eyegor, Egon, Igon, let's call the whole thing off. Oops. myl: I agree that Pinker's analysis rings true, and it's the first thing I've read of Pinker's that I largely agree with since he defended Lawrence Summers. It does matter to me how Gladwell works (even if only because his conclusions so often tend toward similar points, and I'd hope to know whether the theories that ground those conclusions come from his interviewees or are his own considered opinion). I don't think I'm alone in considering it important whether he knows what he's talking about, or whether his gift is to find interesting things other people have said that he presents more or less straight. mdl: I had been hoping the LL proprietors would take up the statistics and deeper meaning of "h" misplacement, including also "rhyme" and "pyrrhic". In a recent extended essay, John McPhee wrote of his heavy dependence on the New Yorker fact checkers, often dropping nonsensical values — and sometimes even fictitious examples — into his text, knowing that the editors will fix them. There doesn't seem to be anything especially wrong with that, but the Igon Value Problem illustrates something else: a fundamental ignorance that makes Gladwell unable to evaluate, independently, the claims he's reporting. Not to defend Gladwell, but Pinker's book The Blank Slate was guilty of the same kind of dilettantism that he dings Gladwell for, including a telltale typo: he quoted Virginia Woolf as saying, "In or about December 1910, human nature changed," when she actually wrote, "On or about December 1910 human character changed. "The Igon Value Problem," indeed. It is simply not true that a quarter back’s rank in the draft is uncorrelated with his success in the pros, that cognitive skills don’t predict a teacher’s effectiveness, that intelligence scores are poorly related to job performance or (the major claim in “Outliers”) that above a minimum I.Q. of 120, higher intelligence does not bring greater intellectual achievements. It's reassuring to know that the greatness of intellectual achievements has been quantified precisely enough to compute a Pearson's r between it and IQ. Certainly, all those efforts to define better impact factors for journals and citation-based metrics for individual scientists are superfluous. Those who try to invent better methods — to compute a more perfect eigenvalue — can go home and fix the plumbing. The work's been done; achievement has been quantified. [(myl) It's clear that you're unhappy with something about quantifying achievement, but it's not clear what. You might mean that grade point averages and standardized-test results are imperfect measures to use in (say) ranking applicants for admissions to academic programs; and that's true, but what's the alternative? The Old Boys' Network? We've tried that, and it wasn't altogether a success. You might mean that counts of journal articles weighted by impact factors are an imperfect measure of academic success, and again, that's true, but would you deny that such things are a reasonable proxy, at least when averaged across many cases? Or are you just insisting that there's reason to continue looking for better ways to test people or to derive measures from the digital record of their work? I don't think that anyone would question that. Gladwell has a new post on his blog defending himself against the Igon attacks. He is a clever guy, he does not go to the root of the matter, but rather chooses to get Pinker ad hominem. His argument is essentially: I am an unscientific googler, but you are as well. Pinker's sin is pride, he could have made a neat point with the Igon Value, but instead he had to go on and add the last paragraphs where he provides 100 arguments for Gladwell's counteratack. The success of M. Gladwell and this whole debate just proves the obvious: that most people don't pay money for science, they pay it for entertainment. If a book can make us feel intelligent for a while and make us and dream that we understand the World, it is already a great achievement. In the field of literature, that is, not in science. Sadly, Pinker doesn't come out looking good in his response either, given his citations. Bill Benzon: "Q. How many people had to be oblivious to the existence of plants in order for this passage to see it's way into print?" tomemos beat me citing the Menand article which is, like most of Menand's work, a great piece of writing. I do feel that most Gladwell bashing makes the basher look quite petty. Igon value at least has the virtue of being a bit more phonetic (probably not the best term but I am not a linguist). Eigenvalues/vectors,svd, et al are very powerful tools with a broad domain of applications, but not having a deep understanding of them hardly implies a lack of statistical sophistication. People that suddenly proclaim the virtues of a certain technique (Google uses it!) are probably just bitter that the virtues of their writing have not translated into Gladwellian sales figures. Gladwell is an entertaining writer, Pinker not so much. Gladwell is hardly infallible, but who exactly is? Julian Barnes, towards the beginning of Letters from London, thanks the copy editors of The New Yorkers for their intelligence and competence. There he recalls that they contacted him frequently, asking him all sort of fact-checking questions, to which he showed heartfelt gratitude. I would be rather taken aback if Gladwell hadn't been made aware of the issue of "igon value" back in 2002. If so, then has he subsequently forgotten to correct the mistake in his manuscript when he submitted it to Hachette? Please do not attack straw men. It offends. The state should not waste on training people with a low chance of being successful. No one says that none of the excluded people will be poor teachers (or whatever) only that the return on investment is not good. If you spend your life working only on potential, without weighing up probability, then I have some junk stock you might be interested in. "Sadly, Pinker doesn't come out looking good in his response either, given his citations." You mean: given Gladwell's ad-hom descriptions of Pinker's citations. Sailer (the alleged white-IQ-supremacist) posted data in the responses and made few, if any, less-than-collegial remarks. He also got ripped by others for posting too much, not to mention the smirking early on about how he was undoubtedly *going* to post. Gladwell's suggestion that blogs are inferior places to find reliable research results is not supportable when we talk about sports-stats research: the very worst such research has been conducted and published by academics, whereas Sabermetrics, the discipline of baseball stats, has generally had its cutting edge in marginal, self-published journals and, for a long time, in rec.sport.baseball. Anybody care to trash Bill James because he did his groundbreaking work while employed as a night watchman? Gladwell acknowledges his error in the response to Pinker he posted on his site; "he is unhappy with my spelling- rightly!" Considering that Gladwell's father was a mathematician, my first thought when I saw that he had made this error was that he grew up hearing the expression "eigenvalue" around the house, that as a child he parsed the expression as some guy's name + "value," and that never got far enough into linear algebra to realize his error. Eigenvalues/vectors,svd, et al are very powerful tools with a broad domain of applications, but not having a deep understanding of them hardly implies a lack of statistical sophistication. Yes, it does. To have any real understanding of how multiple quantities are correlated, one needs to understand matrix mathematics. Eigenvalues are the most important element of that subject. For "statistical sophistication" to be anything more than a sophism, it must entail an understanding of linear algebra. Linguistically, it seems to me, the most interesting thing about Gladwell's book is that probably its best-known piece (the one with which Pinker starts) is based on a sort of wordplay. As Pinker summarizes its subject: why are there many forms of mustard but only one kind of ketchup? More specifically, Gladwell argues that there a scientific reasons why the Heublein company was able to make billions by introducing a premium mustard (Grey Poupon), but couldn't sell a premium ketchup. The trouble is that if we substitute for the word "ketchup" the phrase "tomato-based spiced sauce for meat," we find that he's "proved" the scientific impossibility of A-1 Steak Sauce (Heubelin's product – or HP, etc., etc.). There are also many kinds of relish, by the way. I would add that the misspelling shows he never looked it up to see if his subjects were being honest, or just toying with him. Am I the only person surprised by that? @Mr Punch: Right you are. The "new ketchup" is probably salsa, which has taken market share from ketchup and which comes in a bazillion varieties of its own. Salsa requires more sophisticated mass-production methods than ketchup (or HP or A1). When those methods became cost-effective, the variety of tomato-based sauces could expand. But ketchup had become such a staple and such an ingrained, well-defined term that the new stuff needed new names. At least here in the US, for a long time ketchup meant one thing with very little variation, whereas we always had at least two kinds of mustard (yellow and brown/deli) at the grocery. Brett to be honest I think that is both bitchy and ignorant. The reason linear algebra is so important is not because it is awesome when someone feels a sense of smug superiority when they know something someone else does not. This sort of analytical/domain knowledge has its place to be sure, but lets be honest, Terence Tao doesn't go around bashing virtual anyone for not knowing something that he does. Plenty of people use sophisticated software to preform (yes and routinely abuse) statistical calculations. Just because they could not write this software on their own, or understand the algorithm of each calculation, hardly discounts everything they say. Statistics is a tricky area and is frequently used for sophistry as this blog routinely points out. However, Malcolm Gladwell does not use bad papers to further conservative politics/gender stereotypes. He looks at quirky/interesting ideas from academics and others who are hardly overrepresented in the press. But to suggest he doesn't have any idea about standard deviations or correlations because he doesn't know what an eigenvalue is petty and also insulting to a much broader class of individuals. [(myl) My reaction was that if Gladwell doesn't know that the term eigenvalue exists, and doesn't care enough about what his interviewees are saying to try to find out, even approximately, what Taleb meant by "igon value", then this decreases my confidence that he understood, even approximately, the substance of the disagreements between Taleb and Niederhoffer. And after reading the article in question, I'm still not sure about this. It's clear that you're unhappy with something about quantifying achievement, but it's not clear what. My apologies for my lack of clarity. I'm not upset about the idea of quantifying achievement; I'm mildly irritated that, given the well-known difficulties with defining and implementing such schemes, Pinker seems to conflate a candidate for measuring one aspect of achievement with achievement itself. If he had said, "Above a threshold of 120, IQ correlates with X", where X is "earnings" or "likelihood of tenure" or "h-index", then his statement would be reasonable. We could have a discussion about it: why the cutoff at 120 instead of some other place, and what are the effects of changing that cutoff point? Does IQ predict some measures of achievement better than others? Is IQ a better or worse predictor than some other widely-used numerical measurement? And so forth. As it stands, it's so vague as to be useless. Re: New Yorker fact checkers, I think there is pretty good evidence that they missed the error, at least somewhere (i.e., the original print version). Below is a comment on Brad DeLong's blog from 2003 which mentions the dreaded igon value. I suspect the New Yorker (perhaps after receiving an email or two) fixed the version in their digital archive. I think the odds that their fact checkers and editors caught it the first time around are low. 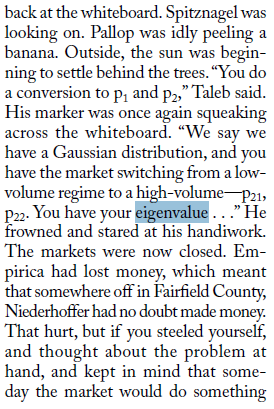 One of my favorite journalistic gaffes is "igon value" from one of Malcolm Gladwell's New Yorker pieces. I guess he and his editors never took a single linear algebra course. (I actually really dig Gladwell's pieces in general). PS Re: IQ of 120 and all that, I side with Pinker. Dr. Taleb states that not editing text is the best route to take: "There is an expert problem with copy editors particularly when they are self-appointed representatives of the “general public”. (“Advice” from book editors reminds me of Warren Buffet’s comment about people in limos taking stock tips from people who ride the subway). Fooled by Randomness was not copy edited (with close to 200 typos in the hardcover edition). My next book (post-TBS) will NOT be edited. An edited text is fake. Really fake. It is as shameful as ghostwriting. Raw literature used to resemble speech, in its messiness, idiosyncrasy, (& charm). Spelling was only made uniform very late, by printers, not by authors –which explains the idiosyncrasies of medieval authors. This ethical stand means that I will not be able to publish Op-Ed, book reviews, etc. in the “general public” and academo-philistine press. I am now left to myself –and the web." Also, Mr. Liberman, Dr. Taleb made an interesting statement on language: "Language is largely made to show-off, gossip, confuse people, delude them, charm them, seduce them, scare them, exploit them, etc. And, as a side effect, convey information. Just a side effect, you fools." You might mean that grade point averages and standardized-test results are imperfect measures to use in (say) ranking applicants for admissions to academic programs; and that's true, but what's the alternative? The Old Boys' Network? We've tried that, and it wasn't altogether a success. You might mean that counts of journal articles weighted by impact factors are an imperfect measure of academic success, and again, that's true, but would you deny that such things are a reasonable proxy, at least when averaged across many cases? I absolutely deny it. I'm a math professor and I have noticed that the "impact factors" (cleverly named to give the impression of relevance and importance) are systematically skewed in a few ways. One: They measure "impact" selectively, by only citing a limited number of publications. Two: They take no account of the difference in citation practices in different fields. Three: The impact factors of math journals are demonstrably contrary to the actual widely recognized value of journals. You may dispute this by citing numbers, but that's the point: if you use numbers to validate numbers, you're using circular reasoning. [(myl) It feels odd to be arguing in favor of citation counts and index factors, since I'm normally on the other side of the argument. I certainly know that journals game the calculation of impact factors, and that they can be quite misleading in some cases. And the whole system may not apply in the same way in mathematics — the fact that Grigori Perelman could get the Fields Medal for work that was never published in a formal way at all is a clue. Indeed, in many of the fields that I work in, hardly any of the real scientific communication takes place in the refereed-journal literature — instead, most of the crucial information flows in conference presentations, in self-publication on arXiv etc., and though colloquia and so on. Journal publication is increasingly a functionally empty cultural ritual, like wearing academic caps and gowns on ceremonial occasions. But still, even in those cases, I would be very surprised to learn that bibliometric measures don't have a positive (and reasonably high) correlation with judgment-based measures of influence. My claim is that there is NO adequate substitute for judgement. Judgement can indeed be abused, as it was often by the Old Boys' Networks we used to depend on, but that doesn't invalidate the argument for judgement any more than the abuse of numbers invalidates their use. You may say we need better numbers, and since these numbers are being used to decide careers, yes, we do, but we can't afford to abandon judgement. [(myl) You'll get no argument from me on this point. And please pardon me for forgetting the quotation marks around the first two paragraphs. "Impact factors", which really are being used to trash people who don't deserve it and promote people who churn out papers, make me all too excited and impatient. "I suppose it's an instance of Muphry's Law that Pinker misspells "sagittal"; Gladwell might not know what it means, but Amazon's "Look Inside!" feature reveals that he does at least manage to get the right number of gs and ts." Pinker's NYT book review — at least now — has the word spelled correctly. Whether it did originally, I don't know. A bit more Google research confirms that, indeed, Pinker's review originally misspelled "sagittal" — the page can be found by searching with the misspelled word, and Google's sample phrases from "the article" including the misspelled word, even though it's no longer in the article on the NY Times website. It's interesting that nobody suggested another plausible interpretation, legalizing "igon." It would be attributing it to the original pronouncer, Nassim Taleb, in a quasi-phonetic ornamental rendering of the "Eastern wizard" accent. If only Gladwell could think of it before answering Pinker! 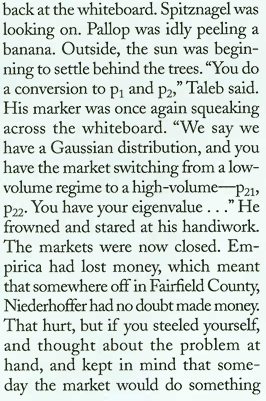 The "Igon value" snafu was noted by a commenter on DeLong's blog in 2003, so it appears the New Yorker corrected it after the original publication. Igon, Egon, Ogon, let's not call the whole thing off yet — not before reading two fine books: "Sensation Fair" ("Marketplatz der Sensationen" in the original), a wonderful volume of evocative and basically true journalistic stories by Egon Erwin Kisch, and the great fantasy vision, "A Wizard of Earthsea" by Ursula LeGuin. I have first-hand evidence from one of Malcolm's interviewees that he cherry-picked some of the data in Blink. Malcolm deliberately ignored evidence by the person to the contrary in order to prove his point and make the story more interesting. Sort of like saying someone ate 80 slices of pizza but omitting it was over a month's time. I probably won't go into details since it could be a bit embarassing for Malcolm and the book's premise (since it contradicts what the book is about, expert intuition). So Malcolm is more sensation journalist than scientific journalist.